I have my first guest blogger -- My Joshua! Hope you enjoy his story. I sure loved hearing about it! 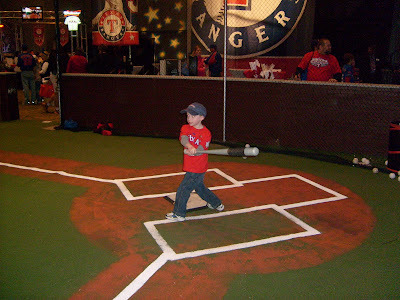 There is an annual tradition that my buddy Jerel and I have had for several years…Rangers Fan Fest. This event is geared towards the biggest Rangers fans. 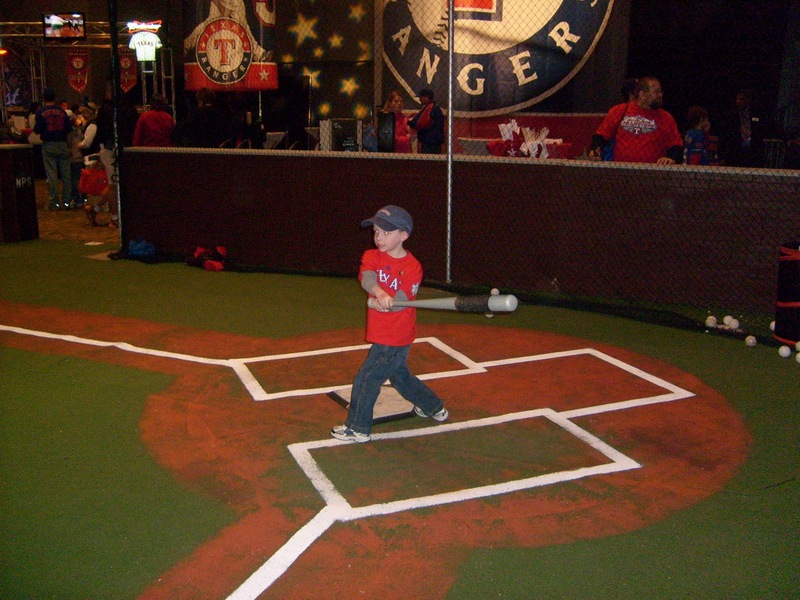 It gives us the opportunity to meet many Rangers players, former and current, as well as enjoy many activities and games. Being the crazed Rangers fans that we are, we look forward to this event with great anticipation every year. This year, however, brought more joy to me than any other Fan Fest I’ve ever attended. Fan Fest is typically a one day event that starts early on a Saturday morning sometime in January and lasts all day. Jerel and I usually meet at Chick-Fil-A, grab a quick bite and are on our way. We generally arrive about 2 and ½ to 3 hours before the gates open and wait in the freezing temperatures for the opportunity to get a ticket to talk to and obtain the autographs of the best players. The only exception this year is that we had 2 days to perform these ridiculous acts. Fan Fest 2011 was a 2 day event! There was only one problem…I could not get there early on Sunday because I teach a class at church (not that this is really a “problem”). Anyway, we had to make arrangements. Jerel was planning to still get there early on Sunday and offered just to let me skip in line when I could get there. I’m sure you are wondering why we would go to such absurd lengths. Well, I will tell you…we love the RANGERS! We are what you could call fanatics. Since I was not going to get there so early on Sunday and did not have to brave the cold weather for so long, I decided to ask Jerel if he minded me bringing Luke, my six year old, with me. He didn’t mind at all. So I decided to bring him along. You may think I deserve to lose my parental rights for subjecting my son to such outrageous conditions, but I have my reasons. You see, Luke has developed a love for the Rangers, especially for their center fielder…2010 AL MVP Josh Hamilton, who was scheduled to sign autographs on Sunday. I brought Luke on the outside chance we would actually score a ticket to get to see Hambone. The only problem is they only had 250 tickets for Hamilton. Seeing as how there were probably more than 5000 people there on Sunday, our chances didn’t look too good. But I was determined to get Luke a chance to meet Josh. While we waited to find out if we were lucky enough to get a Josh Hamilton ticket, i took Luke around to enjoy some of the activities. He hit home runs and caught fly balls. The time came to find out if you were the lucky winner of one of the 250 Hamilton autograph tickets and, as I was afraid of, none of our tickets matched the winning numbers. I was deflated. Since we were not going to get to go through Josh’s line, I at least wanted to take Luke to where he would walk from the private area to his signing table. So we waited for Josh to walk through and at least speak to him. While we were waiting, they announced over the P.A. 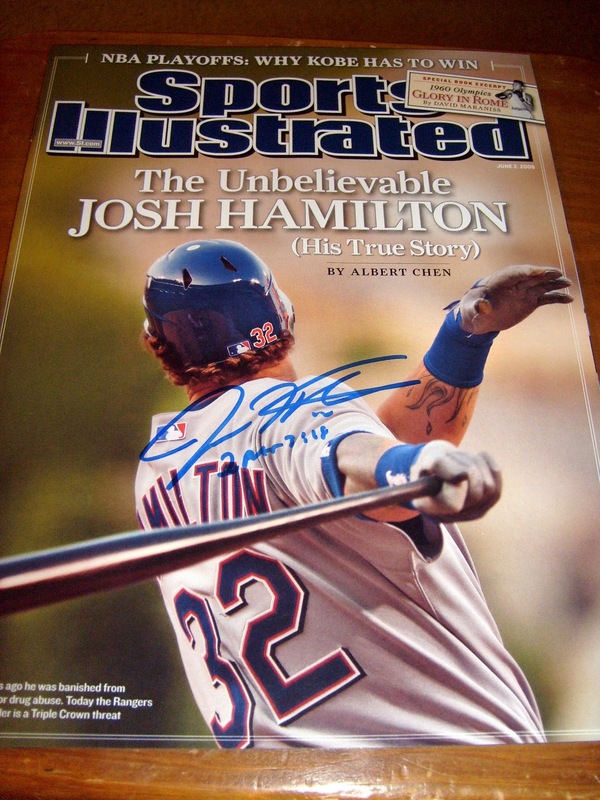 that there were 10 tickets left to see Josh Hamilton. They were going to ask Rangers trivia questions to decide who got the last 10 spots! If there is anyone who can answer pretty much any question about the Rangers, it’s…well, Jerel. So off we went to try and score some tickets. Now, once again, the odds were not in our favor. There were probably 300 people vying for 10 spots. 3 of the tickets had been given away when Jerel answered a question and won a ticket. 6 left. The questions kept coming and the tickets kept going. 5 left…4…3…2…the last question had been asked. I knew the answer! Call on me! Call on me! Call on me! The final ticket had been won…not by me. I knew exactly how Charlie felt when they announced the final golden ticket was gone. Except I wasn’t going to let that be it. I had already made a deal with Jerel that if I didn’t win, he would take Luke through the line with him. But I didn’t want Jerel to take Luke with him…I wanted to take Luke to meet Josh. I found the lady with the 10 extra tickets and told her that I knew the answer and, well, I begged her for a ticket. She said she was all out. That was it. Just like that I had to rely on someone else to introduce Luke to his favorite baseball player. 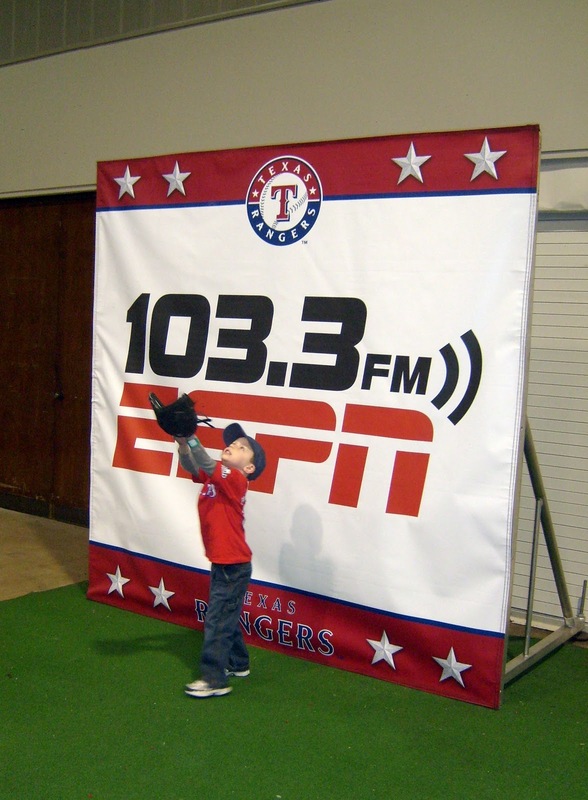 Chuck Morgan is the vice president of In-Park Entertainment and the longtime voice of the Rangers as the public address announcer. As he walks by, the lady says to him that I had answered a question, but she didn’t have any tickets left. This was not exactly true, but hey, who am I to argue? Chuck reaches into his pocket and pulls out an autograph ticket for Josh Hamilton, smiles at me and Luke, winks and hands me the ticket. It took a moment for it to register. Once I had gathered my thoughts I knelt down and showed it to Luke and said we needed to get in line. To enter the line, you had to redeem your ticket for a wrist band. You only got one wrist band per ticket, so when the guy told me to hold out my arm, I said “Nope. Put it on this guy”, and pointed to Luke. As we neared the table, I explained to Luke that I would help him up so he could see Josh. I handed him the item to get autographed, an issue of Sports Illustrated with Hambone on the cover. I helped him up to the table and as he handed the magazine to Josh, I stepped back to observe what I can only describe as surreal. 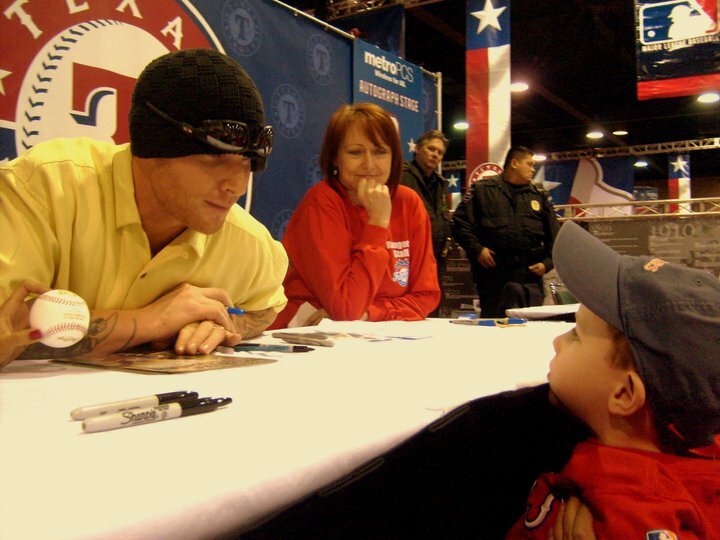 I have the utmost respect for Josh Hamilton because of the mountain he has climbed and the adversities he has overcome to become, not only a tremendous athlete, but an inspiring role model by the way he lives his life. But while I watched him lean over the table and engage in conversation with a 6 year old boy, that respect multiplied by leaps and bounds. He talked with Luke for a few minutes and I told him thanks and wished him good luck on the upcoming season. Fan Fest 2011 ended up just like I had hoped…we just had to go through a strange detour to get there, but it was worth it! 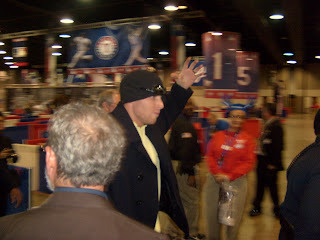 Hamilton even threw up the claw for us on the way out!